Every year, we celebrate Safer Internet Day, to raise awareness around internet safety and drive the concept of digital citizenship. This year too, we invited students between the age of 10 and 17, to show the world their superpowers by showcasing what what it takes to be safe online. When we announced the contest three months ago, we invited teenagers from India to join the global brigade of Web Rangers and help us make the web a safer place for everyone. With their creative ideas, teenagers helped us spread the message of internet safety and good digital citizenship, whilst empowering their friends and families to have a safer and meaningful digital experience. Thousands of students from across the country took us by surprise, with their creative submissions and vivid imagination. Over 50% of the entries were from non-metro cities including Ukhra in West Bengal, Hingna in Maharashtra and Davanagere in Karnataka, proving that teenagers from deep interiors of the country are just as conscious of digital citizenship and safe practices on the internet. From AI powered bots to educative apps, innovative stop motion videos to striking posters, the 5000+ entries definitely raised the bar this year and helped Web Rangers touch a new high. The submissions were judged on creativity, reach, impact and accuracy of the messaging. 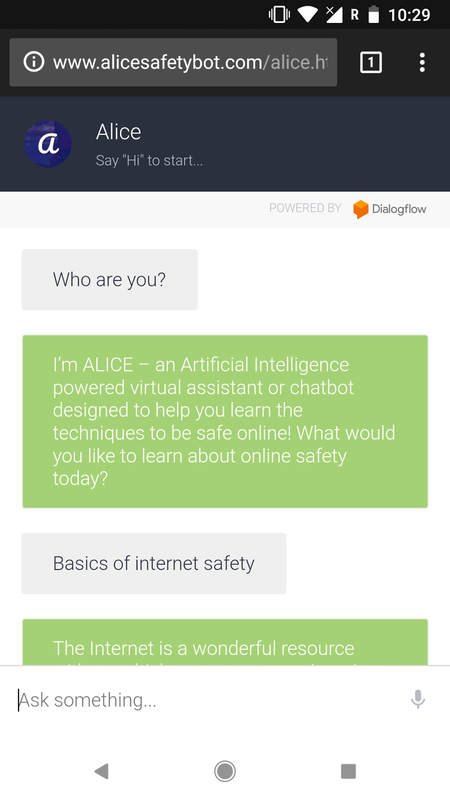 Arjun designed an artificial intelligence (AI) powered virtual assistant called “Alice Safety Bot” that answers your internet safety related queries by simply chatting with the bot on the Google Assistant platform. The instructions on how to use Alice Safety Bot is listed on his website www.alicesafetybot.com; he also allows users to contribute towards the repository of information to help make the bot become more effective over time. And that’s not all, he is also offering users the option to download ALICE Safety Bot's program code to embed it in their application or website free of cost. Arjun plans to make his bot more accessible across the world by localizing it in a number of Indian and international languages. Web Ranger # Mrigank Pawagi, 13 years, Noida, U.P. Mrigank Pawagi, a student of class 8th, has designed a gaming app call WebME - an Interactive Android game that teaches users the fundamentals of Cyber Security in a fun and exciting way and can also be played offline. Each level of the game has its own set of lessons and facts that users can learn and players who win, get a certificate for bragging rights. Read more about it on his blog here or check out this video he created. Juyeong took the creative route and put together a well crafted stop motion video. The colorful video and peppy background score act as the perfect foil to get the viewer’s attention and to highlight 3 important safety basics that all internet users should follow. She believes that following these basic tips will significantly help users stay safe online - and we agree. In their campaign, the team of 16 year olds from Pune produced and shared multiple educative stop motion videos on their YouTube channel and Instagram account. The team created elaborate sketches using just legos to showcase multiple scenarios on how users can be impacted if they are not careful online. Through their videos, they have highlighted the importance of a number of issues like Cyber Bullying, protecting passwords and cyber crime. Akashdeep from Ranchi blew us away with his creativity and skill. In his poster, he brought together technology and mythology to communicate a powerful message about internet safety. He has addressed the issue of phishing and crimes on social media but has also shown the various ways one can stay safe online. He believes that the Web Rangers community can join together as a powerful force to protect the web and fight cybercrime. This year is also special as we have announced our collaboration with NCERT to bring lessons on ‘Digital Citizenship’ to classrooms in in India. Students from class I - class XII across 1.4 million schools in India will now learn how to become good and responsible digital citizens, through structured classroom modules on the social, ethical and legal aspects of Internet safety. According to reports, children are getting exposed to the Internet from the age of three and are spending twice the amount of time on the internet and on the screens than their parents think they do. This makes it important for us to start a dialogue on the dangers and threats they can be exposed to when surfing the net. Through our course integration with NCERT, we aim to catch children young and teach them the essentials of staying safe, while exploring the online world. The program includes a range of specific resources for kids, and educators, enabling them with the tools they need to learn and educate themselves on internet safety. The syllabus for online safety presented in the curriculum will be systematically graded and has been divided into four overarching themes - Being Smart; Being Safe; Being a Digital Citizen and Being Future Ready. The curriculum is structured to match the intellectual and curiosity needs of different age group of the children. For example, in lower classes, students will focus on engaging with technology and learning the use of basic digital tools. In middle classes students will be introduced to basics of the internet, concepts of account safety and distinguishing good content from bad. As they advance through their classes, they will be taught more advanced topics such as privacy, device management, intellectual property and reputation management. Finally, as they become ready to graduate as digital citizens, they will be prepared with online financial literacy and cyber crime concepts so that they are future ready. Google has also created a curriculum for teachers, so that they can help students and kids learn all about digital citizenship in their classrooms. In the last three years, we have proactively partnered with many like minded organisations and the Government to work towards raising awareness about Digital Citizenship and Internet Safety among all age groups in India.